Days and weeks before editors pile high backstage to get a first glimpse of a designer's collection, an intimate group gathers at the designer's showroom to test how the beauty look works with the collection. This meeting, called a model test, includes the designer, key makeup artist, key hairstylist, a model and a stylist. And this season, Beauty Blitz. Here's an intimate look at how the Rebecca Taylor fall 2013 look was born. At the Rebecca Taylor showroom, the MAC Cosmetics team unpacked suitcases filled with products and neatly arranged them for lead makeup artist Sil Bruinsma to use as a work station. Sil Bruinsma kept a selection of tools on hand to blend, sweep and smudge the look. After completing a look, makeup pros create a face chart for the beauty team to use as a blueprint the day of the show. Sil blends the model's skin into creamy perfection. 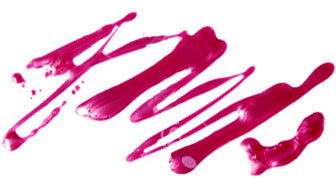 Adding a touch of moisture to the cupid's bow creates luminosity that makes lips appear full. On minimal beauty looks, various types of clear products can add depth (shiny lacquers) and texture (satiny finishes). Sil carefully dots MAC's new Orpheus kohl pencil between the lashes. Even with a giant stash of brushes, Sil grabs a Q-tip to smudge liner. Caffeine on display atop a showroom shelf. The day of the show was cold and rainy in NYC. One model arrived in combat boots (left), but later changed into these strappy numbers (right). A model's final look backstage. Her makeup artist's carefully transcribed cheat sheet. Sil gives Rebecca a backstage touchup moments before her show begins. The wardrobe and beauty statements cause guests to gasp with glee. Bravo! And this entire process was documented by E! News. Check it out!